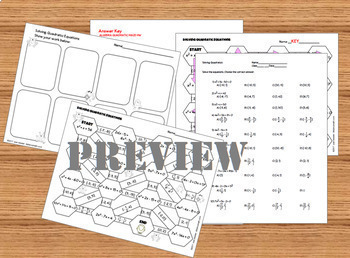 This Digital Activity Bundle of 11 Resources for Quadratics Equations includes a variety of engaging activities for your students. Resources include Digital Task Cards, Concept Maps, Assessments, Mazes, Sorts, Graphing, Applications, Games, Scavenger Hunts. Some have Printable versions and / or HW. 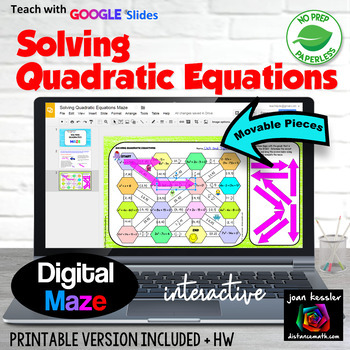 In this self-checking paperless Google® version of the activity, students solve quadratic equations. 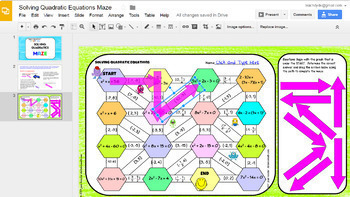 and interact digitally with the maze Each solution leads to the next problem as they work around a maze with fifteen problems using Drag & Drop. All of the answers are rational which gives you latitude to determine which method(s) for your students to use. Use this as a review for the Factoring method, Completing the square, or the Quadratic formula, or let your students choose their own method. 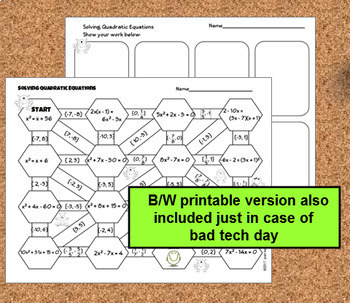 I have also included a black and white printable version of the maze in case of a bad tech day. As a blended bonus, also included is a 10 question printable multiple choice handout with similar questions which can be used for HW, assessment or enrichment, and a printable students response page in order for your students to stay organized. An answer key is included. Please view the preview to make sure these problems are appropriate for your classes. ✓ Incorporate technology that students are familiar with into your lessons.